Where do I use my World Sim voucher code? "Get Special Offers delivered straight to your inbox when you sign up for the Worldsim newsletter." A Worldsim is ideal for those travelling abroad whether it be for business, leisure, holidaying or taking a gap year. The Worldsim range of Travel Essentials has been developed to take the hassle out of travelling when it comes to technology. We have all incurred those unexpected charges whilst travelling before and at Worldsim, they want to help you avoid that at all costs. Boasting a range of international roaming solutions, smartwatches, Portable Wifi options and so much more - everything you need to stay in contact whilst travelling internationally in an easy and cost-effective way. Everything provided by Worldsim is suitable for both leisure and business use and cover every aspect of your trip from SIM cards to selfie sticks. Browse through the full collection today and don’t hesitate to add one of our money-saving Voucher Codes onto your order to help you pay less when you buy online. An international SIM Card is designed to help you stay in contact when you travel and help you to ultimately reduce your roaming charges by up to 85%. 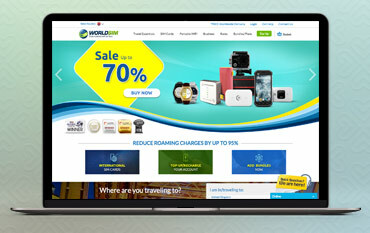 You can get a FREE International SIM card online at Worldsim which boasts an exciting array of benefits for leisure and business travellers alike. Enjoy Free incoming calls in over 118 countries, low cost calls, Data and SMS worldwide. You can also add data bundles to your plan once your sim arrives and can be used as a data sim in iPads or Tablets. These SIMS also work in any unlocked handsets and are compatible with all SIM sizes. You don’t have to worry about having to get rid of your existing phone number either, you can use that with the Worldsim Virtual Numbers Service as well as been given a Free UK and USA mobile number to use whilst you travel. If you’re a business traveller, with the help of Worldsim, you can increase productivity and reduce travel expenses whilst staying connected where you choose to travel. You can significantly reduce your international roaming charges whenever you or your employees travel for business. Enjoy free incoming calls in 95 countries alongside reducing the costs of using your phone abroad with the Worldsim reduced call, SMS and data rates. You can also manage your SIM cards online either as an individual or from a master account. The SIM is completely free of charge and comes as a triple pack including a standard size, micro and a nano making them compatible with an array of devices. See what Worldsim can offer your business right now! World sim is an award-winning prepaid global roaming sim card which offers you free of charge incoming calls and low roaming charges! When you’re abroad, for business or leisure, a Worldsim is the best way to avoid any expensive roaming costs. With a World sim Voucher Code you can order and save on your next travel sim which covers texts, internet browsing and calls so you can get the complete package for less! Receive calls in over 90 countries and make calls for a fraction of the cost of normal operator prices. If you’re a keen traveller, see what Worldsim can offer you today.